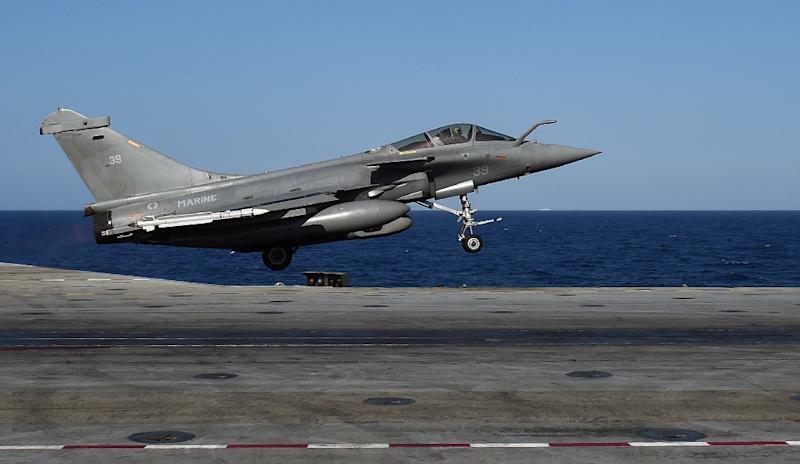 Brussels (AFP) - France launched military missions over Islamic State areas in Syria and Iraq Monday from a newly-deployed aircraft carrier as Brussels was locked down for a third day amid fears of a repeat of the Paris terror attacks. President Francois Hollande met British Premier David Cameron in Paris in an effort to widen an international alliance against the jihadist group as the Charles de Gaulle, stationed in the eastern Mediterranean, went into action. In Europe's institutional capital, police in Brussels arrested five more people but Paris attacks suspect Salah Abdeslam remained at large. Schools, public buildings and the metro were closed, with armed police and troops out in force on quiet streets. Belgian Prime Minister Charles Michel warned late Sunday as he extended the security alert that the city faced a "serious and imminent" threat of attacks similar to those claimed by IS which left 130 people dead across Paris. Hollande told Cameron that Britain and France had a "joint obligation" to strike at the jihadist group blamed for a series of bloody attacks, including the downing of a Russian airliner in Egypt with the loss of 224 lives. Top-line French Rafale jets loaded with bombs were catapulted from the flight deck of the 42,500-tonne nuclear-powered carrier as Cameron and Hollande spoke, an AFP reporter onboard saw. "We will intensify our strikes, choosing targets that will do the most damage possible to this army of terrorists," Hollande said. The British premier, who earlier laid a wreath at the Bataclan concert venue in Paris where 90 people including a British man died on November 13, offered France the use of a British airbase in Cyprus. Cameron said that he firmly supported France's actions against IS in Syria, adding that "it's my firm conviction that Britain should do so too." Britain has joined in US-led attacks on IS in Iraq but so far Cameron has failed to get parliamentary support for sorties into Syria although it appears he may win approval shortly. The web of fear from the Paris attacks has spread across Europe, especially to Belgium where some of the assailants had lived before the violence. Belgian prosecutors said police had arrested another five people in fresh raids Monday, bringing to 21 the number held since Sunday. Abdeslam, Europe's most wanted role for his alleged role in the attacks, is believed to remain on the run after officials said he was not among those arrested. Abdeslam's elder brother Brahim blew himself up outside a Paris bar in the November 13 attacks. Interior Minister Jan Jambon told Belgian media: "The operation is not finished. We will continue until we clean up this mess." With residents struggling to get to work by bus and bike, Jambon conceded the level four security alert had clear costs and was disruptive but warned it must "continue as long as necessary." "Yes there are consequences; but if there was an attack like in Paris, think what would be the consequences of that!" Officials were due to complete a fresh threat assessment later Monday, with an announcement to follow. 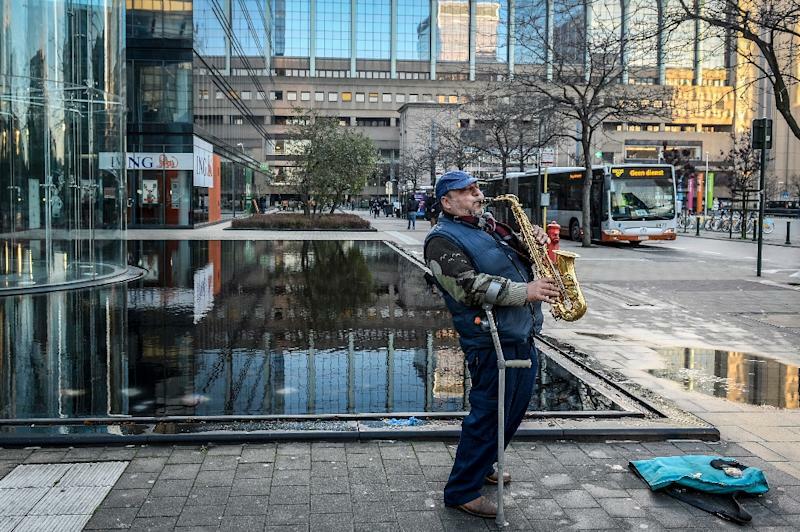 In Brussels, people were trying to go about their daily lives as normally as possible despite the closure of all schools, universities and nurseries. "I hope it's just for today, and that tomorrow will be calm," said Tatiana, a young mother whose eight-year-old son Oleg's scholl was closed. In the normally bustling historic Grande Place, a few bars and restaurants were open for business but it was hard going to get customers. The European Union and NATO, headquartered in Brussels, both said they would bolster security and urged non-essential staff to work from home on Monday. The rest of the country, including Brussels airport, remains on security alert level three, meaning an attack is considered possible and the threat credible. 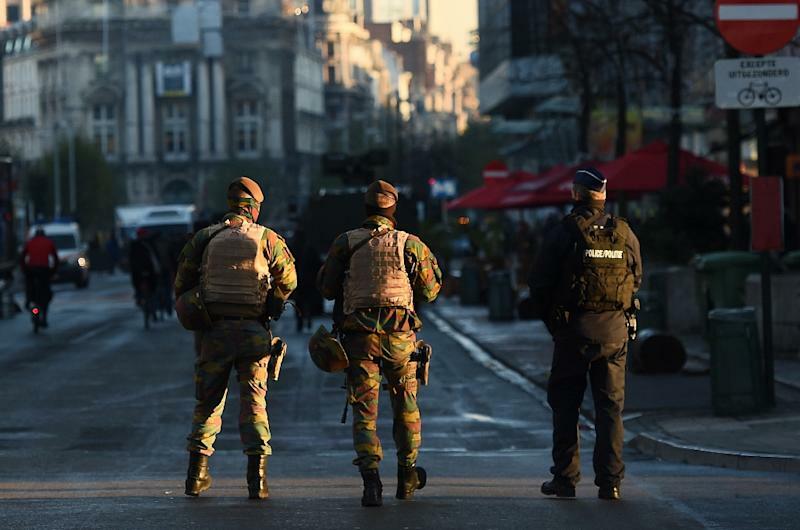 "If I look over the past two decades at counter-terrorism actions here in Belgium, we have never seen such a scale of deployment as demonstrated last night," Pieter Van Ostaeyen, an analyst on Islamic extremism, told AFP. In Paris, police chief Michel Cadot said French security forces numbering some 10,200 police and 6,400 soldiers had conducted early 300 searches in the Paris region. "We see a number of messages from (IS) being broadcast on the Internet and which clearly target France," Cadot said. "The threat level remains raised." Hollande's meeting with Cameron Monday marked the start of a diplomatic offensive to build a broad anti-IS coalition. The French leader was due to meet US President Barack Obama on Tuesday and then Germany's Angela Merkel and Russia's Vladimir Putin on the subsequent two days. The UN Security Council on Friday authorised "all necessary measures" to fight jihadist violence.